3 On the Coat of Arms of El Salvador, the country's name is written "Republica de El Salvador en la America Central," Meaning "Republic of El Salvador in the Central America"
El Salvador, officially the Republic of El Salvador, is a country in Central America, bordering the Pacific Ocean between Guatemala and Honduras. With a population of over 6.9 million people, El Salvador is the most densely populated nation on the American mainland and is undergoing rapid industrialization. The country was named after the Spanish word for "The Savior," in honor of Jesus Christ. For many decades, coffee was the mainspring of the Salvadoran economy. The civil war and the fall of international coffee prices in the 1990s pressured the government to develop other export industries, such as textiles, and promote tourism. Among the attractions are Mayan ruins, numerous extinct and active volcanoes, and the Monte Cristo cloud forest. El Salvador is located in Central America. It has a total area of 8,123 square miles (21,040 km²), making it almost the same size as the state of Massachusetts. El Salvador shares borders with Guatemala (126 mi / 203 km) and Honduras (212.5 mi / 342 km). It is the only Central American country that does not have a Caribbean coastline. The highest point in the country is Cerro El Pital at 8,957 feet (2,730 m). 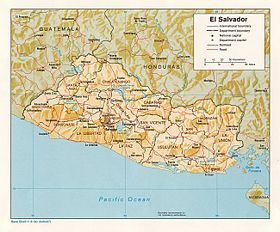 El Salvador is the smallest country in continental America. Several small rivers flow through it into the Pacific Ocean, including the Goascorán, Jiboa, Torola, Paz and the Río Grande de San Miguel. Only the largest river, the Lempa River, flowing from Honduras across El Salvador to the Pacific Ocean, is navigable for commercial traffic. Volcanic craters enclose lakes, the most important of which are Lake Ilopango and Lake Coatepeque. Lake Güija is El Salvador's largest natural lake. Several artificial lakes were created by the damming of the Lempa. El Salvador has a tropical climate with pronounced wet and dry seasons. Temperatures vary primarily with elevation and show little seasonal change. The Pacific lowlands are uniformly hot; the central plateau and mountain areas are more moderate and may even approach freezing. The rainy season extends from May to October. Almost all the annual rainfall occurs during this time, and yearly totals, particularly on southern-facing mountain slopes, can be as high as 200 centimeters. Protected areas and the central plateau receive lesser, although still significant, amounts. Rainfall during this season generally comes from low pressure over the Pacific and usually falls in heavy afternoon thunderstorms. Although hurricanes occasionally form in the Pacific, they seldom affect El Salvador, with the notable exception of Hurricane Mitch in 1998. El Salvador's location in Central America also makes it vulnerable to hurricanes coming off the Caribbean; however, this risk is much less than for other Central American countries. From November through April, the northeast trade winds control weather patterns. During these months, air flowing from the Caribbean has had most of the precipitation wrung out of it while passing over the mountains in Honduras. By the time this air reaches El Salvador, it is dry, hot, and hazy. Located on the Pacific's earthquake-prone Ring of Fire and at latitudes plagued by hurricanes, El Salvador's history is a litany of catastrophe, including the Great Hurricane of 1780 that killed 22,000 in Central America and earthquakes in 1854 and 1917 that devastated El Salvador and destroyed most of the capital city. More recently, an October 1986 earthquake killed 1,400 and seriously damaged the nation's infrastructure; in 1998, Hurricane Mitch killed 10,000 in the region, although El Salvador—lacking a Caribbean coast—suffered less than Honduras and Nicaragua. Major earthquakes in January and February of 2001 took another 1,000 lives and left thousands more homeless and jobless. El Salvador's largest volcano, Santa Ana (also known by its indigenous name Ilamatepec), erupted in October 2005, spewing tons of sulfuric gas, ash, and rock on surrounding communities and coffee plantations and killing two people and permanently displaced 5,000. Also in October 2005, Hurricane Stan unleashed heavy rains that caused flooding throughout El Salvador. In all, the flooding caused 67 deaths, and more than 50,000 people were evacuated during the crisis. Damages from the storm were estimated at $355.6 million. El Salvador's position on the Pacific Ocean also makes it subject to severe weather conditions, including heavy rainstorms and severe droughts, both of which may be made more extreme by the El Niño and La Niña effects. In the summer of 2001, a severe drought destroyed 80 percent of the country's crops, causing famine in the countryside. 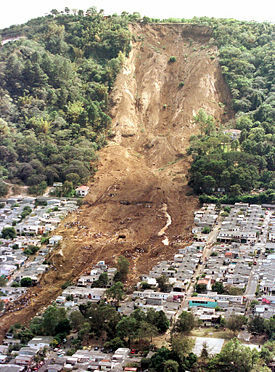 On October 4, 2005, severe rains resulted in dangerous flooding and landslides, which caused at minimum 50 deaths. Where El Salvador, Guatemala, and Honduras meet lies a nature reserve that protects the Monte Cristo cloud forest, a tropical forest at a high altitude that is usually enveloped in clouds. Towering oak and laurel trees create a canopy overhead, and the high humidity and rainfall creates a habitat for such plants as orchids, ferns, and mosses. Animals found there include spider monkeys, porcupines, anteaters, and opossums. Toucans, nightingales, hummingbirds, and woodpeckers are among the birds. In the hot, coastal plains grow palm and fruit trees. Reptiles such as crocodiles and turtles, as well as fish, live in the many rivers, lakes, and coastal waters. But much of El Salvador's trees were cut down to export the wood and clear land for farming. 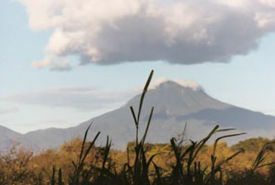 The scenic Jiboa Valley and San Vicente volcano. Mayan ruins have been excavated at Tazumal and San Andre, providing evidence their culture was present in 5000 B.C.E. Aztec and Pipil peoples succeeded them. 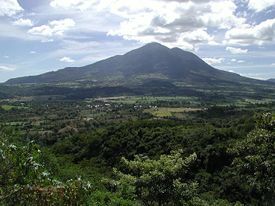 El Salvador was known as "Nequepio" to the tribes that inhabited the region prior to the migration from northern Mesoamerica. The Pipils, who arrived from central Mexico, renamed the area Cuscatlán, because of the lushness of the land. Cuscatlán translates as "Land of Precious Jewels." In the early sixteenth century, Spanish conquistadors ventured into Central America from Mexico. Spain's efforts to extend its dominion to the area that would become El Salvador were firmly resisted by the Pipil and their remaining Mayan-speaking neighbors. Pedro de Alvarado, a lieutenant of Hernan Cortes, led the first effort by Spanish forces in 1524. Led by a war–leader tradition calls Atlacatl, the indigenous people defeated the Spaniards and forced them to withdraw to Guatemala. Two subsequent expeditions were required—the first in 1525, followed by a smaller group in 1528—to bring the Pipil under Spanish control. Toward the end of 1810, a combination of external and internal factors allowed Central American elites to attempt to gain independence from the Spanish crown. The internal factors were mainly the interest the elites had in controlling the territories they owned without involvement from Spanish authorities. The external factors were the success of the French and American revolutions in the eighteenth century and the weakening of the military power of the Spanish crown because of its wars against Napoleonic France. The independence movement was consolidated on November 5, 1811, when Salvadorian priest Jose Matías Delgado sounded the bells of the Iglesia La Merced in San Salvador, making a call for insurrection. After many years of internal fights, the Acta de Independencia (Act of Independence) of Central America was signed in Guatemala on September 15, 1821. On September 16, 1821, Mexico gained independence as the First Mexican Empire. El Salvador and the other Central American provinces declared their independence from Spain and became part of the Mexican Empire. In 1823, the United Provinces of Central America was formed by the five Central American states. When this federation was dissolved in 1838, El Salvador became an independent republic. From 1872 to 1898, El Salvador was a prime mover in attempts to reestablish an isthmian federation. The governments of El Salvador, Honduras, and Nicaragua formed the Greater Republic of Central America via the Pact of Amapala in 1895. Although Guatemala and Costa Rica considered joining the Greater Republic (which was rechristened the United States of Central America when its constitution went into effect in 1898), neither country joined. This union, which had planned to establish its capital city at Amapala on the Golfo de Fonseca, did not survive a seizure of power in El Salvador in 1898.
the suppression of rural discontent. As the coffee industry grew, the bulk of the government's financial support came from duties on goods imported with the foreign currencies that coffee sales earned. This support, coupled with corruption, ensured the coffee growers of overwhelming influence within the government. El Salvador's early history as an independent state—as with others in Central America—was marked by frequent revolutions; not until the period 1900-1930 was relative stability achieved. The economic elite, based on agriculture and some mining, ruled the country in conjunction with the military, and the power structure remained in the control of the "Fourteen Families" of wealthy landowners. The economy prospered or suffered as the world coffee price fluctuated. From 1931—the year of the coup in which Gen. Maximiliano Hernández Martínez came to power—until he was deposed in 1944, there was brutal suppression of rural resistance. The most notable event was the 1932 Salvadoran peasant uprising, commonly referred to as La Matanza (the massacre), headed by Farabundo Martí and the retaliation led by Martinez's government, in which approximately 30,000 indigenous people and political opponents were murdered, imprisoned, or exiled. Until 1980, all but one Salvadoran temporary president was an army officer. Periodic presidential elections were seldom free or fair. The origins of the Salvadoran civil war lie in the early 1970s. Salvadoran industry and economy had been devastated by the Football War with Honduras in 1969. The roots of this Football War were issues over land reform and immigration. Honduras is more than five times the size of neighboring El Salvador, even though in 1969, El Salvador had a population that was more than double that of Honduras. At the beginning of the twentieth century, Salvadorans had begun migrating into Honduras in large numbers in search of jobs, and by 1969, more than 350,000 Salvadorans were living in Honduras (20 percent of the Honduran peasant population). In 1969, Honduras enacted a new land reform law that took land away from Salvadoran immigrants and redistributed it to native-born Hondurans. Thousands of Salvadorans were displaced. These existing tensions between the two countries were inflamed by rioting during the second North American qualifying round for the 1970 FIFA World Cup. On July 14, 1969, the Salvadoran army attacked Honduras. The Organization of American States negotiated a cease-fire, which took effect on July 20, and Salvadoran troops were withdrawn in early August. Eleven years later the two nations signed a peace treaty that put their border dispute before the International Court of Justice. 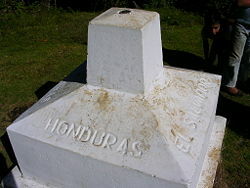 In 1992, the Court awarded most of the disputed territory to Honduras, and in 1998, Honduras and El Salvador signed a border demarcation treaty to implement the terms of the decree. The Football War had a devastating effect on El Salvador's economy. Many Salvadorans had been forcibly exiled or had fled from war-torn Honduras. Most had to provide for themselves, with very little assistance, in a land already dealing with overpopulation and extreme poverty. Trade between Honduras and El Salvador had been disrupted and the border officially closed. The war led to a 22-year suspension of the Central American Common Market, a regional integration project. The social situation worsened in El Salvador as the government proved unable to satisfy the economic needs of citizens deported from Honduras. The resulting social unrest was one of the causes of the civil war that followed. The war was predominantly fought between the government and a coalition of four leftist guerrilla groups and one communist group known as the Farabundo Martí National Liberation Front (FMLN) between 1980 and 1992. In the context of Cold War concerns about growing Soviet involvement in the Western Hemisphere, the United States gave aid to El Salvador's government. More than 75,000 people are estimated to have died in the conflict. By 1991, however, a new willingness to cooperate was emerging. A truce was declared in April and negotiations concluded in January 1992. The opposing sides signed peace accords that ended the war, brought the military under civilian control, and allowed the former guerrillas to form a legitimate political party and to participate in elections. A new constitution was enacted. The political framework of El Salvador takes place in a presidential representative democratic republic, whereby the president (Elias Antonio Saca in 2007) is both head of state and head of government. The president is elected by universal suffrage and serves for a five-year term by absolute majority vote. A second round runoff is required in the event that no candidate receives more than 50 percent of the first round vote. Executive power is exercised by the government. Legislative power is vested in both the government and the Legislative Assembly. Members of the assembly, also elected by universal suffrage, serve for three-year terms. The next elections will be held in February and March 2009. A strongly Roman Catholic nation, El Salvador is one of three countries in the world where abortion is illegal with no exceptions, along with Chile and Nicaragua. The judiciary is independent of the executive and the legislature. Action on peace accord-driven constitutional reforms designed to improve the administration of justice was largely completed in 1996 with legislative approval of several amendments and the revision of the Criminal Procedure Code—with broad political consensus. Conservatives, including some members of the military, created the Nationalist Republican Alliance party (ARENA) in 1981. ARENA almost won the election in 1984 with solid private-sector and rural farmer support. By 1989, ARENA had attracted the support of business groups. Multiple factors contributed to ARENA victories in the 1988 legislative and 1989 presidential elections, including allegations of corruption in the ruling Christian Democratic party, poor relations with the private sector, and historically low prices for the nation's main agricultural exports. The successes of Alfredo Cristiani's 1989-1994 administration in achieving a peace agreement to end the civil war and in improving the nation's economy helped ARENA—led by former San Salvador mayor Armando Calderon Sol—keep both the presidency and a working majority in the Legislative Assembly in the 1994 elections. ARENA's legislative position was weakened in the 1997 elections, but it recovered its strength, helped by divisions in the opposition, in time for another victory in the 1999 presidential race, bringing President Francisco Guillermo Flores Perez to office. Flores concentrated on modernizing the economy and strengthening bilateral relations with the U.S. by becoming a committed partner in anti-terror efforts, sending troops to aid in the reconstruction of Iraq, and by playing a key role in negotiations for the Central American Free Trade Agreement (CAFTA). Despite these constraints, ARENA made a strong showing in the March 2004 presidential election, which was marked by an unprecedented 67 percent voter turnout. ARENA candidate Elias "Tony" Saca handily defeated the FMLN candidate and party head Schafik Handal, garnering 57.71 percent of the votes cast. Nevertheless, Saca faced a complex political environment. The defeat of FMLN's presidential candidate rekindled an FMLN internal struggle between party hardliners and more moderate party members who saw the party's 2004 defeat as a call for reform. In addition, the PCN and the two parties that comprise the center/center-left coalition, the United Democratic Center (CDU) and the Christian Democratic Party (PDC), faced dissolution for failing to each capture at least 3 percent of the votes. Members of all three parties, whose deputies continued to hold seats in the legislature, publicly discussed creating new parties or aligning with existing ones. In March 12, 2006 Legislative Assembly and municipal elections, the ruling ARENA party garnered 34 Assembly deputies and 147 mayoralties, while the opposition FMLN won 32 legislative seats and 51 city halls (plus 8 additional mayoralties in which they participated as part of a coalition). The PCN, PDC, and CD carried 10, 6, and 2 Legislative Assembly seats, respectively. As with the 2003-2006 Assembly, the combined 44 seats of ARENA and their center-right PCN allies are sufficient for all legislation requiring a 43-vote simple majority, while the FMLN can still block legislation requiring a two-thirds (56 votes) supermajority. El Salvador's political parties have already begun preparation and planning for 2009, when presidential, Legislative Assembly, and municipal elections will be held simultaneously for the first time since 1994. El Salvador is a member of the United Nations and several of its specialized agencies, the Organization of American States (OAS), the Central American Common Market (CACM), the Central American Parliament, and the Central American Integration System. It actively participates in the Central American Security Commission (CASC), which seeks to promote regional arms control. From 2002-2003, El Salvador was chair of the OAS anti-terrorism coordinating body, CICTE. El Salvador also is a member of the World Trade Organization and is pursuing regional free trade agreements. An active participant in the Summit of the Americas process, El Salvador chairs a working group on market access under the Free Trade Area of the Americas initiative. El Salvador has joined its six Central American neighbors in signing the Alliance for Sustainable Development, known as the Conjunta Centroamerica-USA or CONCAUSA to promote sustainable economic development in the region. El Salvador enjoys normal diplomatic and trade relations with all of its neighboring countries including Honduras, with which it previously had territorial disputes. While the two nations continue to disagree over the status of their maritime borders in the Gulf of Fonseca, they have agreed to settle their land-border disputes with the International Court of Justice (ICJ). In September 1992, the Court awarded most of the territory in question to Honduras. In January 1998, Honduras and El Salvador signed a border demarcation treaty to implement the terms of the ICJ decree. U.S.-Salvadoran relations remain close and strong. El Salvador has been a member of the coalition of nations fighting against terrorism and has also provided a battalion to the efforts to bring stability to Iraq. El Salvador is divided into 14 departments, which, in turn, are subdivided into 267 municipalities. During the 12-year civil war, human rights violations by both the government security forces and left-wing guerrillas were rampant. The accords ending the war established a Truth Commission under UN auspices to investigate the most serious cases. The commission reported its findings in 1993 and recommended that those identified as human rights violators be removed from all government and military posts. Thereafter, the Legislative Assembly granted amnesty for political crimes committed during the war. Among those freed as a result were the Salvadoran Armed Forces (ESAF) officers convicted in the November 1989 Jesuit murders and the FMLN ex-combatants held for the 1991 murders of two U.S. servicemen. The peace accords also established the Ad Hoc Commission to evaluate the human rights record of the ESAF officer corps. In accordance with the peace agreements, the constitution was amended to prohibit the military from playing an internal security role except under extraordinary circumstances. Demobilization of Salvadoran military forces generally proceeded on schedule throughout the process. The Treasury Police, National Guard, and National Police were abolished, and military intelligence functions were transferred to civilian control. By 1993—nine months ahead of schedule—the military had cut personnel from a war-time high of 63,000 to the level of 32,000 required by the peace accords. By 1999, ESAF strength stood at less than 15,000, consisting of personnel in the army, navy, and air force. A purge of military officers accused of human rights abuses and corruption was completed in 1993 in compliance with the Ad Hoc Commission's recommendations. The military's new doctrine, professionalism, and complete withdrawal from political and economic affairs leave it the most respected institution in El Salvador. Today, El Salvador is a constitutional, multiparty democracy with an estimated population of 6.9 million. In 2004 voters elected Elias Antonio Saca of the Nationalist Republican Alliance (ARENA) as president for a five-year term in generally free and fair elections. Nationwide municipal and Legislative Assembly elections were also free and fair. Civilian authorities generally maintain effective control of the security forces. Although the government generally respects the rights of its citizens, protection of human rights is undermined by widespread violent crime, including gang-related violence, impunity, and corruption. The most significant human rights problems included harsh, violent, and overcrowded prison conditions; lengthy pretrial detention; inefficiency and corruption in the judicial system; violence and discrimination against women; abuses against children, child labor, and forced child prostitution; trafficking in persons; discrimination against persons with disabilities; discrimination against indigenous persons; discrimination against persons based on sexual orientation; and lack of enforcement of labor rights. The Salvadoran economy has experienced mixed results from the recent government's commitment to free market initiatives and conservative fiscal management that include the privatization of the banking system, telecommunications, public pensions, electrical distribution, and some electrical generation, reduction of import duties, elimination of price controls, and an improved enforcement of intellectual property rights. The GDP has been growing at a steady and moderate pace in an environment of macroeconomic stability since the signing of peace accords in 1992. A problem that the Salvadorian economy faces is inequality in the distribution of income. In 1999, the richest fifth of the population received 45 percent of the country's income, while the poorest fifth received only 5.6 percent. As of December 1999, net international reserves equaled US$1.8 billion or roughly five months of imports. Having this hard currency buffer to work with, the Salvadoran government undertook a monetary integration plan beginning January 1, 2001, by which the U.S. dollar became legal tender alongside the Salvadoran colón, and all formal accounting was done in U.S. dollars. This way, the government has formally limited its possibility of implementing open market monetary policies to influence short-term variables in the economy. Since 2004, the colón has stopped circulating and is now never used in the country for any type of transaction. In general, there was discontent with the shift to the U.S. dollar, primarily due to wage stagnation vis-a-vis basic commodity pricing in the marketplace. Additionally there are contentions that reverting to the colón would be disastrous to the economy. The change to the dollar also precipitated a trend toward lower interest rates in El Salvador, helping many to secure much-needed credit for house or car purchases. A challenge in El Salvador has been developing new growth sectors for a more diversified economy. As with many other former colonies, for many years El Salvador was considered a mono-export economy (one that depended heavily on one type of export). During colonial times, the Spanish decided that El Salvador would produce and export indigo, but after the invention of synthetic dyes in the nineteenth century, Salvadoran authorities turned to coffee as the main export. Since the cultivation of coffee required the higher-elevation lands in the country, many of these lands were expropriated and given or sold cheaply to those who could cultivate coffee. The government provided little or no compensation to the indigenous peoples. On occasion, this compensation implied merely the right to work for seasons in the newly created coffee farms and to be allowed to grow their own food. Such actions provided the basis of conflicts that would shape the political landscape of El Salvador for years to come. For many decades, coffee was one of the only sources of foreign currency in the Salvadoran economy. The Salvadoran civil war in the 1980s and the fall of international coffee prices in the 1990s pressured the Salvadoran government to diversify the economy. The government has followed policies that intend to develop other export industries, such as textiles and sea products. Tourism is another industry seen as a possibility. But rampant crime rates, lack of infrastructure, and inadequate social capital have prevented this resource from being properly exploited, and it is still underdeveloped. There are 15 free trade zones in El Salvador. The largest beneficiary has been the maquila industry, which consists primarily of supplying labor for the cutting and assembling of clothes for export to the United States. El Salvador signed the Central American Free Trade Agreement (CAFTA) — negotiated by the five countries of Central America and the Dominican Republic — with the United States in 2004. To take advantage of CAFTA, the Salvadoran government is challenged to conduct policies that guarantee better conditions for entrepreneurs and workers to transfer from declining to growing sectors in the economy. El Salvador has also signed free trade agreements with Mexico, Chile, the Dominican Republic, and Panama, and it has increased its exports to those countries. El Salvador, Guatemala, Honduras, and Nicaragua also are negotiating a free trade agreement with Canada, and negotiations started in 2006 for a free trade agreement with Colombia. Fiscal policy has been the biggest challenge for the Salvadoran government. The 1992 peace accords committed the government to heavy expenditures for transition programs and social services. The Stability Adjustment Programs (PAE, for the initials in Spanish) initiated by President Cristiani's administration committed the government to the privatization of banks, the pension system, and the electric and telephone companies. The total privatization of the pension system has resulted in a serious burden for the public finance system, because the newly created private Pension Association Funds did not absorb coverage of retired pensioners covered under the old system. The government lost the revenues from contributors and absorbed completely the costs of coverage of retired pensioners. This has been the main source of fiscal imbalance. ARENA governments have financed this deficit with the emission of bonds, something the leftist FMLN has opposed. Debates surrounding the emission of bonds have stalled the approval of the national budget for many months on several occasions. The emission of bonds and the approval of government loans need a qualified majority (three-fourths of the votes) in the national legislature. If the deficit is not financed through a loan a simple majority is enough to approve the budget. Many specialists claim that it is impossible to advance significant development programs with such little public sector aid. (The tax burden in the United States is around 25 percent of the GDP and in developed countries of the EU it can reach 50 percent.) The government has focused on improving the collection of its current revenues with a focus on indirect taxes. Leftist politicians criticize such a structure, since indirect taxes (like the value-added tax) affect everyone alike, whereas direct taxes can be weighed according to levels of income. A 10 percent value-added tax (VAT), implemented in September 1992, was raised to 13 percent in July 1995. The VAT is the biggest source of revenue, accounting for about 52.3 percent of total tax revenues in 2004. Inflation has been steady and among the lowest in the region. Since 1997 inflation has averaged 3 percent, increasing to nearly 5 percent in recent years. From 2000 to 2006 total exports have grown 19 percent, from $2.94 billion to $3.51 billion. During this same period total imports rose 54 percent, from $4.95 billion to $7.63 billion. This has resulted in a 102 percent increase in the trade deficit, from $2.01 billion to $4.12 billion. Remittances from Salvadorans living and working in the United States are a major source of foreign income and offset the substantial trade deficit. Remittances have increased steadily in the last decade and reached an all-time high of $2.547 billion in 2005 (an increase of 21 percent over the previous year), approximately 16.2 percent of gross domestic product (GDP). Remittances have had positive and negative effects on El Salvador. In 2005 the number of people living in extreme poverty in El Salvador was 16 percent, according to a United Nations Development Program report. Without remittances, the number of Salvadorans living in extreme poverty would rise to 37 percent. While Salvadoran education levels have gone up, wage expectations have risen faster than either skills or productivity. For example, some Salvadorans are no longer willing to take jobs that pay them less than what they receive monthly from family members abroad. This has led to an influx of Hondurans and Nicaraguans who are willing to work for the prevailing wage. Also, the local propensity for consumption over investment has increased. Money from remittances have also increased prices for certain commodities such as real estate. Many Salvadorans abroad earning much higher wages can afford higher prices for houses in El Salvador than local Salvadorans and thus push up the prices that all Salvadorans must pay. As of September 2006, net international reserves stood at $2.02 billion. Between 1996 and 2006, 7.3 million visitors helped generate a record $1.7 billion. Most of the North American and European tourists are seeking out El Salvador's beaches and nightlife. More and more continue to be drawn by El Salvador's turbulent past. The latest tourist attractions in the former war-torn El Salvador are gun fragments, pictures, combat plans, and mountain hideouts. Since 1992, residents in economically depressed areas are trying to profit from these remains. El Salvador's population numbers around 6.9 million people, 90 percent of whom are mestizo (of mixed Amerindian and Spanish origin), while 9 percent are white (mostly of Spanish descent, but there are also some of French, German, Swiss, and Italian descent). El Salvador is one percent indigenous, mostly Pipil and Lenca. Very few Amerindians have retained their native customs, traditions, or languages, especially in the wake communist-led labor strikes followed by the 1932 government crackdown in which the Salvadoran military murdered up to 40,000 peasants. El Salvador is the only Central American country that has no visible African population due to its relative inaccessibility to the Atlantic slave trade. In addition, Gen. Maximiliano Hernandez Martinez instituted race laws in 1930 that prohibited blacks from entering the country; this changed during the 1980s and the law was removed. However, Salvadorans with African heritage are present, most notably in San Salvador, the capital. Spanish is the official language and therefore spoken by virtually all inhabitants (some of the indigenous still speak their native tongue Nahuatl). English is also spoken by many, since a number have studied or lived in English-speaking countries. Although nominally Roman Catholic, Protestantism is growing rapidly and already accounts for more than 20 percent of the population. Anglican, Presbyterian, Methodist, and Seventh-Day Adventist churches are all growing rapidly, as are Pentecostals, Mormons, and Muslims. The capital city of San Salvador has about 2.1 million people; an estimated 42 percent of the country's population live in rural areas. Urbanization has expanded at a phenomenal rate since the 1960s, creating growth problems for cities around the country. According to the most recent United Nations survey, life expectancy for men was 68 years and 74 years for women. Education in El Salvador is free through ninth grade. The national literacy rate for adults is 84.1 percent. As of 2004, there were approximately 3.2 million Salvadorans living outside El Salvador, with more than one million of whom are undocumented immigrants in the United States. By 2007 the Salvadorian ambassador to the United States estimated that one quarter of the nation's population live in the United States.Expatriates send an estimated $2.8 billion in remittances to their families back in El Salvador. Many Salvadoran-Americans are legal immigrants. The United States has traditionally been the destination of choice for Salvadorans looking for greater economic opportunity. Through the Sanctuary Movement of the 1980s, religious activists brought in tens of thousands of refugees from El Salvador to the United States, many suffering persecution from their government for activities related to liberation theology. Salvadorans also live in nearby Guatemala and Nicaragua. Other countries with notable Salvadoran communities include Canada, Mexico, the Cayman Islands, Sweden, Italy, and Australia. The majority of the expatriates emigrated during the civil war of the 1980s due to adverse economic and social conditions. Spanish is the official language of El Salvador, but many locals speak English. The Roman Catholic religion plays an important role in the Salvadorian culture. Important foreign personalities in El Salvador were the Jesuit priests and professors Ignacio Ellacuria, Ignacio Martín-Baró, and Segundo Montes. Painting, ceramics, and textile goods are the main manual artistic expressions. Writers Francisco Gavidia (1863–1955), Salarrué (Salvador Salazar Arrué) (1899-1975), Claudia Lars, Alfredo Espino, Pedro Geoffroy, Manlio Argueta, José Roberto Cea, and poet Roque Dalton are among the most important writers to stem from El Salvador. Notable twentieth-century personages include the late filmmaker Baltasar Polio, artist Fernando Llort, and caricaturist Toño Salazar. Amongst the more renowned representatives of the graphic arts are the painters Noe Canjura, Carlos Cañas, Julia Díaz, Camilo Minero, Ricardo Carbonell, Roberto Huezo, and many others. El Salvador's most notable dish is the pupusa, a thick hand-made corn tortilla (made using masa de maíz or masa de arroz, a maize or rice flour dough used in Latin American cuisine) stuffed with one or more of the following: cheese (queso) (usually a soft Salvadoran cheese called Quesillo con loroco), fried pork rind (chicharrón), chicken (pollo), refried beans (frijoles refritos), and/or queso con loroco (loroco is an edible vine flower bud from Central America). New stuffings such as shrimp or ayote (squash) are used by adventurous restaurants. Immigrants have brought pupusas to areas such as California, Virginia, Washington, D.C., and other locations. Pupusas are usually served with curtido (a type of either spicy coleslaw or pickled/vinegared cabbage), and a tomato-based sauce. They are eaten with the fingers. Pupusas come from the Pipil-Nahuatl word pupushahua, which means tortilla filled with cheese, beans, chicharrón (pork cracklin's), ayote, cream, carrots, etc. They were first eaten by the natives almost three millennia ago. Two other typical Salvadoran dishes are Yuca Frita and Pan con Chumpe (Pavo). The Yuca Frita is deep fried and served with curtido (Salvadoran pickled cabbage salad) with chicharrones or pepesquitas (fried baby sardines) on top. The Pan con Chumpe (Pavo = turkey) is a marinated turkey, roasted and handpulled, submarine sandwich (hoagie) that is sold at local stands and is very tasty because of the many Pipil spices (annatto, clove, allspice, pepper) used to roast the turkey. El Salvador is a Central American country whose culture is a mixture of Mayan, Pipil, and Spanish. Its music includes religious songs (mostly Roman Catholic) used to celebrate Christmas and other holidays, especially feast days of the saints. Satirical and rural lyrical themes are common. Popular styles in modern El Salvador include salsa, cumbia, hip hop, rap, and reggae. ↑ UNdata El Salvador. UN (2008). Retrieved December 23, 2011. ↑ 3.0 3.1 3.2 3.3 El Salvador. International Monetary Fund. Retrieved December 23, 2011. ↑ What is the El Salvadorian colon (SVC)? Currency.com Retrieved December 23, 2011. ↑ N.C. Aizenman. "The Face of El Salvador's Charm Offensive: Consul General Uses Personal Touch to Woo Expatriate Community," January 9, 2007 .Washington Post. Retrieved June 22, 2008. This page was last modified on 18 September 2017, at 22:09.